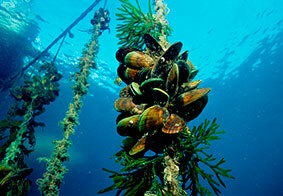 Greenshell Mussel provides a high source of protein, vitamins, minerals, and omega-3 fatty acids. It has been shown to be effective in helping joint mobility and reducing pain. • May significantly increases joint mobility and reduces pain levels. • Stabilized with a natural botanical extract protecting the lipid and Omega-3 fraction. • Natural pain relief without the side effects of arthritic drugs. which is a farmed resource.